Sarah Happel is a top leadership coach, trainer & speaker helping people cultivate powerful conversations; improving relationships, & producing greater results. Audiences leave with breakthrough thinking for breakthrough results. Sarah Happel is a top leadership coach who excels in cultivating excellence in leadership through her work with individuals, teams and organizations. 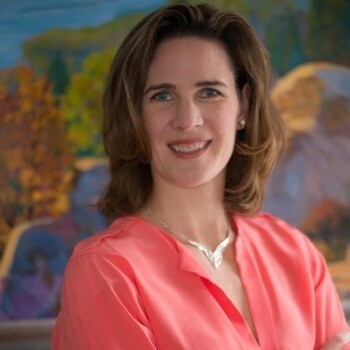 Formerly an internationally competitive volleyball player, Sarah helps people determine winning strategies for their organizations through her work as a speaker, coach and facilitator. She is a frequent speaker and panalist on leadership trends, managing difficult conversations, and SOAR, a 6-month leadership-development program yeilding personal and professional results for teams and their organizations. With over 15 years in the field of communication and transition management, Sarah has worked with multi-cultural organizations from 5 continents in 4 languages: German, Spanish, Italian and Finnish. Through self-awareness and intentionally practicing what success feels like, Sarah helps her clients achieve the next level of leadership mastery while achieving the results that make a difference for their organizations. Her methodology is to engage the audience: promoting dynamic, hands-on learning that people can use immediately. Sarah is a leader in the field of coaching. Accredited by the International Coach Federation (PCC) and certified as a leadership coach by Georgetown University’s acclaimed Leadership Coaching program, she has held numerous leadership roles with the International Coach Federation. Prior to becoming a leadership coach, Sarah was a Fulbright Grantee, researching the credibility of female war correspondents at the University of Helsinki, and has taught Human Communication at Lasell College in Boston. Sarah is well versed in the use of assessment instruments as part of a coaching or leadership development process and frequently uses the MBTI and Hay Group’s ESCI (Emotional Intelligence assessment). She has an Advanced Leadership Coaching Certification in Well-Being from George Mason University. Sarah resides in Vienna, Virginia with her husband and three sons. Find out more about Sarah Happel at http://www.SpectrumLeadershipSolutions.com.